The astral sciences have a long history in Arabic. As Daniel Stolz shows in his new book The Lighthouse and the Observatory: Islam, Science, and Empire in Late Ottoman Egypt, the rise of new astronomical techniques and instruments did not so much challenge as reformulate these. Take the handbook to the stars composed sometime between the 1820s and 1830s by Muhammad al-Khudari and his students entitled Sharh al-lum‘a fi hall al-kawakib al-sab‘a. This “illuminated” commentary on the seven heavenly orbs discussed old as much as new cosmographical models, alongside old and new mathematical techniques and observational instruments for the art of timekeeping and the science of stargazing. The commentaries and texts also followed a classical exegetical style as much as the classical planetary typology. Only the classical seven astral bodies were described, and therefore no mention was made of Uranus or the new asteroids then discovered. They also do not include any discussion of the heliocentric epicycles of these planets. The value of these sciences was also described in classical terms. In his introduction, al-Khudari begins his eulogy on the “art of timekeeping” by praising it as that through which “one arrives at the contemplation of heavenly bodies . . . is aided in the consideration of the heavens and earth . . . [and] is baffled by the subtleties of the wisdom and marvels of creation.” Later, he includes a discussion of the different techniques for calculating astrological charts. Introducing these, he emphasized how “knowing the ascendant house of the zodiac” allowed for knowledge of such things as “the science of letters, talismans, times, spiritual beings” and the “extraction of precious metals.” It also allowed one to answer questions and determine such things as the “conditions of the ill, the fulfillment of wishes, the circumstances of officials.” The manuscript collection of texts also shows the authors using both old and new tools and techniques to construct daily prayer schedules and annual timetables. The latter were especially complex as they aimed to synchronize the various calendric systems in use in late Ottoman Egypt, each with different year zeros and lunar or astral cycles at work, including the Arabic, Coptic, Hebrew, Seleucid (rumi), and Yazdigird (farsi). The methods and application of astral knowledge and the cosmological sciences in late Ottoman Egypt were widely capacious and they made recourse to a number of overlapping, rather than competing, systems of meanings and interpretations throughout the nineteenth century and beyond. Stolz’s The Lighthouse and the Observatory is an engagingly written and impressively researched study that highlights precisely this diversity. Uncovering the lost history of al-Khudari’s commentary alongside scores of other manuscripts and print matter, it follows the story of the rise of modern astronomy in Egypt through a number of key figures, institutions, and texts. As the book shows so well, numerous epistemic traditions and practices coexisted well into the turn of the century, including overlapping methods of measuring time, calendric calculations, the determination—and significance—of planetary positions, and finally the ability to measure, survey, and possibly even predict movements in time and space. And as the book also shows so well, the introduction of modern astronomical techniques and texts by no means initiated a sense of conflict or crisis for traditional Muslim scholars in the region. As described, many Egyptian authors, timekeepers, state surveyors, and bureaucrats deftly combined older Muslim traditions of knowledge with the new sciences. In all these ways, different forms of knowledge were at work simultaneously, from scriptural and astrological portents and signs to contemporary observatory data, technologies, and tables. Indeed, the range of sources and topics covered by Stolz here is impressive. Unlike many histories of the nineteenth century, Stolz emphasizes how “the ‘age of steam and print’ was also the age of manuscripts and sundials,” and one of the strengths of this book is its use of manuscript archives (such as Max Meyerhof’s collection of manuscripts, now at the University of Michigan). Yet, it does not ignore the impact of the press: several chapters describe such well-known “Nahdawi” journals as al-Muqtataf and al-Manar, while others detail government-issued publications and pamphlets. As the book highlights, together, science and print helped to solidify and create new literary and even political networks. How the history of science can inform histories of the modern Middle East (and vice versa) is precisely what The Lighthouse and the Observatory invites us to consider. As Stolz argues, we should understand the history of science in the vicegeral state squarely within the field of Ottoman studies. As such, he integrates the political, institutional, and social historical background to the years covered, or roughly from the 1830s to the early 1900s. In the process, the book sheds light on a range of interconnected histories, such as the novel bureaucratization of the Egyptian state and of the Ottoman Empire at large; the rise of European commercial and imperial interests in the region; the Orientalist fascination with the history of science in Islam; and, finally, the rapid disciplinary, institutional, and infrastructural transformations in Ottoman Egypt on the eve of colonialism. Part I of the book, for example, offers a fascinating study of the gradual transformation of classically-trained scholars of the astral sciences while highlighting some of these diverse contexts. As in the case of the two “Falakis,” Mahmud Bey and Ismail Pasha, we witness how the rise of new government bureaucrats and astronomers led to the creation of new techniques and texts as they journeyed on state-sponsored expeditions, carried out surveys, and constructed astronomical maps of Egypt (and beyond). In fact, much of Stolz’s argument—particularly as outlined in the later chapters of Parts II and III—is concerned with how these new sciences (and their state-sponsored scientists) fundamentally transformed state discourses and practices. The use of new scientific instruments, techniques, and concepts were, in effect, part of a much broader set of social, political, and institutional transformations. Overall, the book emphasizes the ways in which Tanzimat-era reforms and the rise of a new effendiya class helped to both create and transform different, overlapping epistemic cultures and how the co-construction of new ideas of the “state” and “science” helped to reinforce one another. The book therefore contributes to a more complex understanding of the relationship between science and the state as much as of that between science and empire. All three terms (science, the state, and empire) are here pluralized in interesting ways: just as old and new sciences created new forms of multiple sovereignty so too, we learn, did overlapping states and empires. Hence “Egypt” emerges here as at times the object and at others the agent of different states or empires (whether Ottoman, Egyptian, or British). Yet, in the end, The Lighthouse and the Observatory tells us as much about the shifting relations between science and the state in Ottoman Egypt as it does about the history of modern science itself. Stolz’s book offers a valuable contribution to those interested in the history of science, technology, and engineering from a global perspective in particular. Here we find the coexistence of old and new astral sciences, with the latter often inspiring new debates and re-readings of older texts among their modern readers. Yet, as Stolz also points out repeatedly, not all of the new astrophysical sciences gathered equal attention. At times Stolz seems overly concerned about the paucity of discussions of the “new” astronomy, particularly the absence of references to such figures as Nicolaus Copernicus, Johannes Kepler, or Pierre-Simon Laplace. Stolz’s response is considered, but perhaps not quite as punchy as it could be. He argues that as these new sciences offered no perceived problem or presumed contradiction with existing worldviews or epistemic orders in late Ottoman Egypt, they therefore inspired little discussion. This seems like more of a description than an explanation. It also implicitly presents a very different story, particularly when set against much of the global historiography on the subject. (Contrast this, for instance, with the controversy generated by missionaries in China a century earlier.) That alone invites us to consider how, worldwide, the “Scientific Revolution” could hardly be said to have been revolutionary at all. I invite the author to consider this more explicitly. In the end, it seems heliocentric astronomical calculations were quietly introduced into a number of Arabic texts and astronomical tables in Egypt by the turn of the nineteenth century, thanks largely, if not only, to the fact that heliocentric calculations proved more accurate and expedient for timekeeping. Yet, Stolz does not highlight the significance of this enough, nor emphasize the irony involved when considering how vastly this differs from the standard historiography of modern science. After all, we know now just how modern the historiographic construction of the “Scientific Revolution” was (a term which was first coined and popularized in the twentieth century). So what do these present absences in Ottoman Egypt tell us in this context? And how might that transform our understanding of how we typically narrate the relation between science and power in the modern world? 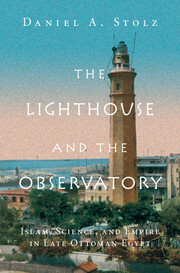 As part of a new series of studies that mark interest in the history of science and histories of Islam, The Lighthouse and the Observatory will no doubt help to shape and transform these growing discussions around questions of science, power, and modernity, as well as invite new questions and topics for future scholars. I also ask the author to consider another such question here, and a notable absence of his own in the book: namely, astrology. Astrology was, of course, one of the oldest sciences for which astral calculations and knowledge were typically deployed in Arabic. As we learn indirectly here (and in the works of numerous other scholars’ recent works), these astrological sciences had a long and tenacious history within the Muslim lands of North Africa and West Asia. And while astrological discourses, texts, and techniques are frequently described in passing in the book, the latter are often dealt with only indirectly. The author does not consider its relation to the modern astral sciences in any detail. For example, in addition to the reference to al-Khudari’s astrological charts with which this essay began, we also hear of how the manuscript made several intriguing references to the use of astrochronologies in particular. Take the conjunction of Jupiter and Saturn mentioned by one of al-Khudari’s students, also apparently only in passing. Described as a configuration that could lead to events of cosmic significance, it also describes how this conjunction could explain both the French invasion of Egypt and Mehmet ‘Ali’s founding of the new technical academies of Egypt in 1798-99 and 1819-20, respectively. As the example of these prophetic histories also shows, the science of timekeeping was not only concerned with technical or even only cosmological matters: it also transformed the very understanding of history and of time itself. I welcome, therefore, reflections from the author on these transformations of time, history, and the cosmos in Ottoman Egypt, and invite him to further comment here on the multiple epistemic, social, and temporal orders they created in their wake.